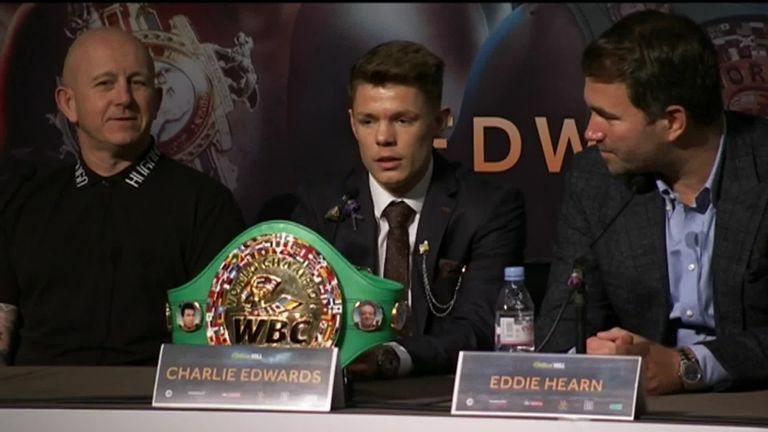 Charlie Edwards admits his ultimate ambition is to become a "British great" as he starts his WBC title reign against Angel Moreno next month. The 25-year-old flyweight faces Spanish challenger Moreno at the Copper Box Arena on March 23, live on Sky Sports, just a few months after he was crowned as WBC champion following a classy points win over Cristofer Rosales at The O2 in December. Edwards is eager to begin the next chapter of his career, having set himself a new target of winning a world title in another weight class. I want to go down as a great, and this first defence is going to be a really good one. "I want to be a British great, and to be a British great I want to be a multi-weight world champion, and this new book, it starts now," said Edwards. "I want to go down as a great, and this first defence is going to be a really good one. I'm really looking forward, and excited about this fight. Angel Moreno is a very good fighter." Potential world title fights against British rival Kal Yafai and Srisaket Sor Rungvisai could lie ahead at super-flyweight, but Edwards is aware of the threat posed by Moreno, who has just two defeats in 23 fights. "First and foremost, I've got to focus 100 per cent on Angel Moreno, he's a top-class operator and a hard fight," said Edwards. "But I believe, and I'll put it out there, this is my time. Timing is everything and it's all come right. "All the other fights, they will unfold in the future. I'm ready now to fight anyone and everyone. "I'm in this sport not to pick and choose my opponents. I just want to build a legacy, and I want to be known as an all-time great in British boxing." Edwards tops a packed bill in the capital, with Joshua Buatsi battling Liam Conroy for the vacant British light-heavyweight belt, while Lawrence Okolie puts his British cruiserweight title on the line against Commonwealth champion Wadi Camacho. Lewis Ritson also returns in a British lightweight title fight against Andy Townend.